Team WeddingSutra collaborated with Karpagam Jewellers and designers Payal Singhal and Julie Shah to create two fabulous trendy looks for this bridal season. Wedding jewellery is the finishing flourish on any bride’s ensemble and a special piece – sentimental or statement – adds a story to the look. For style-savvy brides, styling your jewellery for different wedding functions can be a challenge. It helps to think of the outfit in tandem with the jewellery so make notes while choosing and see which goes best with which. WeddingSutra shows you how with bridal jewellery brand Karpagam Jewellers. Every piece of jewellery from Karpagam Jewellers is created considering the tastes and preferences of discerning brides-to-be. Whether it’s a mehndi ceremony or your sangeet function, their jewellery is versatile and adds a precise poise to any ensemble. We at WeddingSutra collaborated with this bridal jewellery brand and designers Payal Singhal and Julie Shah to create a series of incredible looks. We had lovely bride-to-be Aishwarya Sarawgi showcase these looks as WeddingSutra Favorite Various Vision Venture captured the candid moments. Look 1: Go chic for your Mehndi with a Karpagam Gold Necklace Set. 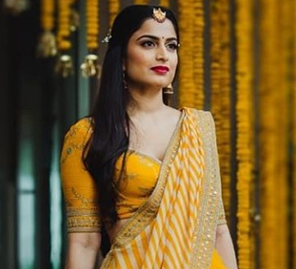 Payal Singhal’s off-the-shoulder crop top with dhoti pants are a standout choice for any bride who wants to step out looking chic and glamorous. Aishwarya accessorized with an exquisite gold antique necklace set from Karpagam Jewellers which elevated the elegance of the ensemble. The exquisite design of the necklace is gorgeous sitting on Aishwarya’s collar bones and is in perfect harmony with the modern luxury of the outfit. Elegant and handcrafted with a radiating design story, you can even match the beautiful set with an elegant saree for a more traditional look. Look 2: Look glamorous at your Reception Party in a Karpagam Gold Choker Set. Clad in this yellow and green tulle lehenga by Julie Shah, Aishwarya is radiant wearing the aesthetically designed gold choker set from Karpagam Jewellers. The masterpiece adds pure class to Aishwarya’s outfit. The piece is very comfortably part of this modern trousseau created for a day of celebration. A perfect set for your glamorous reception party, let the necklace be the highlight of your look. An ultimate nod to chic and glam, Aishwarya looks sophisticated and graceful.